You will have to refer to my detailed write-up on this - It explains the core concepts of the Java Memory Architecture, the ones that should get you started to understand this evolution better. 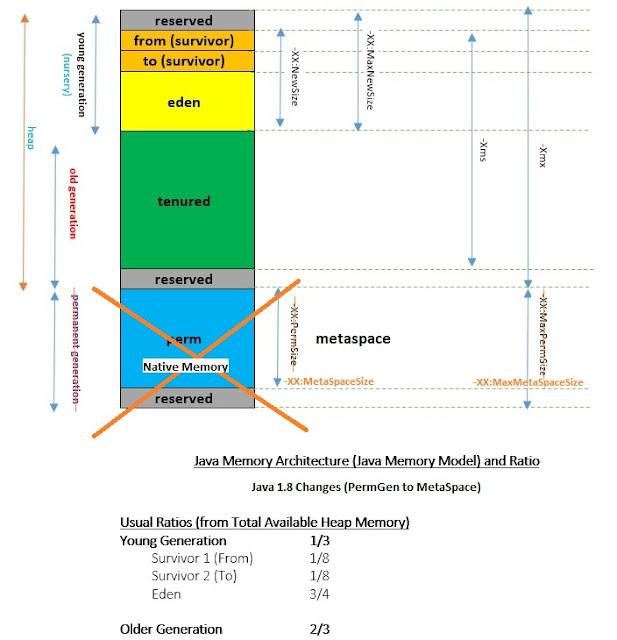 The article is at : https://dzone.com/articles/java-memory-architecture-model-garbage-collection Most of the original concepts of the Java Memory Architecture are covered in detail in this article. This articles also provides information on Garbage Collection, Memory Leaks and Most Common Memory Out of Memory Issues. String Literals in Java are stored in String Pool. String Interning refers to a process or method by which only one copy of a specific string is stored in the memory. This is is done to allow efficient usage of memory and also of less time to retrieve, except when the string is first created. This immutable single copy of the String is called intern. Java provides a method in the String class, intern() to actually create/retrieve this copy of the string. The above Java 7 Changes of String Handling continued into Java 8. Further In Java 8, the following change was made to the memory handling related to String Interning. Note: Many authors have erroneously stated that PermGen is part of the Java Heap. You have to note this fact that PermGen was/is never Java Heap - It was only allocated as part of Contiguous Memory as the Java Heap. In case of Metaspace, such a Contiguous Allocation does not exist, Metaspace lies in or is allocated in the Native Memory of the Operating System.